Home » Canada » I think the SatNav is trying to kill us….. The first thing on the itinerary for the day was to meet with the local tourism office in Drumheller. The trip would take around an hour and a half from Calgary and with the bags all packed up in the car again, we programmed the SatNav and set off at 9am. The meeting was set to take place at 11am so we figured that would leave us enough time to drive leisurely and arrive with time to spare to find the civic centre and park. The first hour of the drive was uneventful enough. Husband had elected to drive which meant I could sit back and relax until we got there. But after the first hour things started to go a bit wrong. 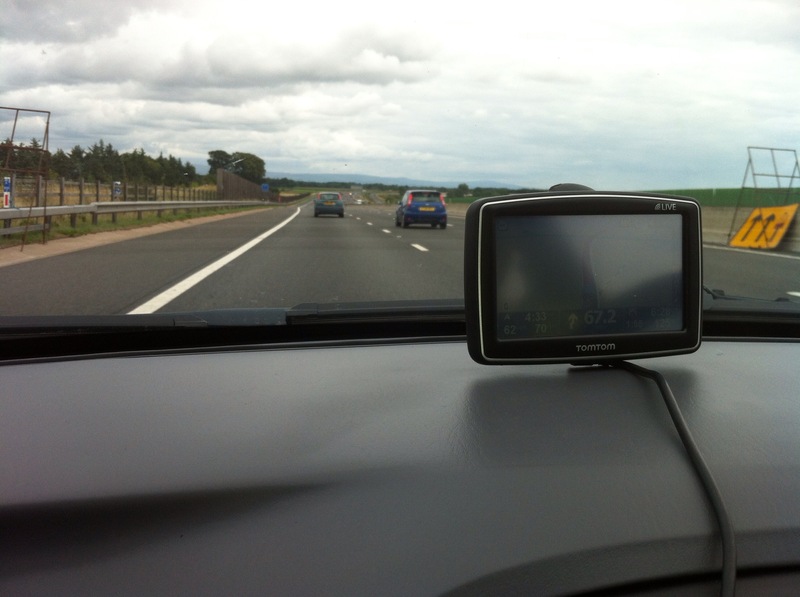 The evil Satnav, just sitting there….plotting…. ‘In 500m turn left’, the polite satnav intoned. ‘She hasn’t let us down so far’ replied Husband, so we dutifully followed her instruction and took a left. The first clue that we were perhaps being taken off the beaten track came a few minutes later we drove up to a prison. Not your usual tourist destination but the Satnav showed that we turned right on to a gravel road before we reached the prison gates. ‘Are you sure this is the way?’ I asked again. ‘It’ll be fine, don’t worry’ Husband said, not looking as sure as he sounded. As the road went on, it got narrower and less car-friendly. We could hear the gravel pinging off the side of the car as we trundled along. The road twisted and turned and we couldn’t see anything but fields all around us. ‘Maybe we should go back?’ I suggested. ‘There’s no way I can do a three point turn on this road, it has to go somewhere’ then he stopped, his face pale. I looked out to see what had turned the usually calm Husband so pale. Below us was a steep incline, no not an incline, a drop. Not far off a 90 degree angle. ‘Fine? FINE! There’s no way we are going to get down there!’ I squealed. Not the actual quarry that tried to kill us (I was too busy concentrating on not dying to take a picture) but you get the idea. ‘People drive these roads all the time here, it’s no big deal’ he sounded as if he was trying to convince himself as much as me. ‘Just trust me’ he said as he edged forward an inch at a time. You know when you are on a rollercoaster? That moment after you have reached the top of the first climb and you pause for a moment before the descent takes you plummeting and screaming back down to earth? As the car was eased forward, gravity started to take hold and we were both pushed forward in our seats, only being held in place by our seatbelts. It was like the worlds most rubbish (and slowest) fairground ride. As we rolled precariously down the vertigo-inducing road, nearing the bottom an inch at a time I squeezed my eyes shut, visions of us overturning and sliding down the rest of the hill on the roof of the car. We would be knocked unconscious and when night fell we would be surrounded by bears, delighted to find the yummiest tinned treats (not that we had seen a single bear on our trip) Then it would start to snow, that famous Canadian snow that lies for months. No one would know where to look for us since we were clearly on the wrong road. We would only be found in the Spring when the snow thawed and our perfectly preserved bodies were found clutching on to our seatbelts and pointing accusingly at the SatNav. After a few moments that could only be described as ‘buttock clenching’, we reached the bottom unscathed and thankful that we were back on even ground. I wanted to get out of the car and kiss the (level) ground but instead we set about trying to find where we were supposed to be. 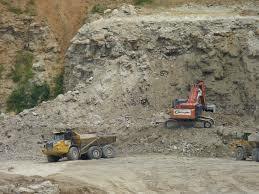 It definitely wasn’t supposed to be in a quarry that’s for sure! I’m sure the SatNav has it in for us….